I completely support your decision to stay. She no longer supports the war. The senator says that he supports the proposed legislation. Which presidential candidate do you support? The study is supported by the American Medical Association. The country's citizens were asked to support the war effort. Her friends supported her by signing her petition. The charity supports needy families. Bombers were called in to support the ground troops. The planet's atmosphere cannot support human life. The team gets a lot of support from its fans. I'd like to thank my parents for all of their love and support over the years. He depended on his wife for emotional support. He applied for financial support from the state. the company's friendly support staff Inspectors found that some of the bridge's supports were weak. She used my arm as a support and limped to the chair. These sneakers are designed to give your feet extra support. These example sentences are selected automatically from various online news sources to reflect current usage of the word 'support.' Views expressed in the examples do not represent the opinion of Merriam-Webster or its editors. Send us feedback. In technical trading analysis, support is a lower limit in a price channel in which a security’s price tends to stay. Price channels can slope up (indicating bullish sentiment) or down (indicating bearish sentiment); they don’t have to simply go “sideways.” The important geometric characteristic is that the resistance lines (which are the opposite of support lines; they are the upper limits of the price channel) and support lines are parallel, as shown in this price channel for ChevronTexaco (CVX). 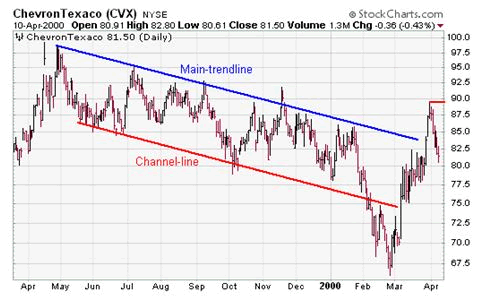 The channel lines themselves are often based on multiday moving averages or logarithmic scales that reflect price movements in percentage terms. However, technical trading is as much an art as it is a science, and so one technical trader’s price channel might be different from another’s. When a stock’s price touches or goes below the support, this may signal a trend change, which is why the support level is very important to technical traders. Price channels help tip traders off about trend changes in a stock or "unusual" activity when the price goes above or below the price channel lines (we call this a breakout). For example, a technical trader might buy when a stock hits the support level of an upward-sloping price channel; similarly, traders hope to be already out of a stock before it hits the support level on a downward-sloping price channel. : the act of helping someone by giving love, encouragement, etc. 1 : to hold up or in position : serve as a foundation or prop for Posts support the porch roof. 2 : to take sides with : favor Which candidate do you support? 3 : to provide evidence for : verify They cannot support this claim. 4 : to pay the costs of : maintain His income supports a large family. 5 : to keep going : sustain There is not enough air to support life. 6 : to provide help or encouragement to My friends supported me while I was sick. What made you want to look up support? Please tell us where you read or heard it (including the quote, if possible).